A tsunami is a series of huge ocean waves created by an underwater disturbance. Causes include earthquakes, landslides, volcanic eruptions, or meteorites--chunks of rock from space that strike the surface of Earth. 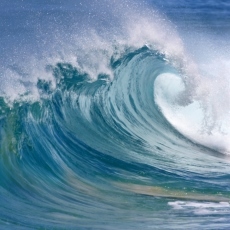 A tsunami can move hundreds of miles per hour in the open ocean. It can smash into land with waves as high as 100 feet or more and cause devastating floods. Drowning is the most common cause of death related to a tsunami. Although there are no guarantees of safety during a tsunami, you can take actions to protect yourself. You should have a disaster plan. Being prepared can help reduce fear, anxiety, and losses. If you do experience a disaster, it is normal to feel stressed. You may need help in finding ways to cope.